Having a spectacular family reunion doesn’t have to be hard or stressful. In fact, the more people that attend means more people to assist with the planning, set up, cooking and clean up. If you are considering organizing a family reunion, take these ideas into consideration. Host a Potluck. You can easily host a potluck dinner at a relative’s home, outdoors at a park or in a church hall. Simply assign dishes for guests to bring based on the first letter of their last name, or do a drawing. The only drawback to this, according to caterers in Cleveland, is that you won’t have any control over the food quantity or quality. Sponsor a Barbeque. If your reunion is taking place during the warmer weather, then it is the perfect time to host a barbeque. Hamburgers, hot dogs, artisanal sausages or even steaks with chimichurri sauce can be delicious main dishes. For a more upscale option, an Akron caterer can cook all of the meats on site and you can provide the side dishes. Themed Dinner. Is your family creative or do they love games? If so, you can host a theme dinner around your family history (Think “All things Irish” or “All things Italian.”). A local caterer can help you to design a menu around your family’s favorite foods. Plan a Picnic. For active families, having an outdoor picnic can create a whole day of fun. Red checked table cloths, dogs playing Frisbee, sand volleyball – each of these activities can lend a festive atmosphere to your party. Offering easy to eat foods such as sliders, homemade macaroni salad and a colorful fruit salad will satisfy the most active appetite. Coordinate a Catered Event. If the central reason for your family reunion is a momentous occasion like a fiftieth wedding anniversary, then a more formal event may be better. Caterers can create a custom menu for your family that will leave them savoring every moment. 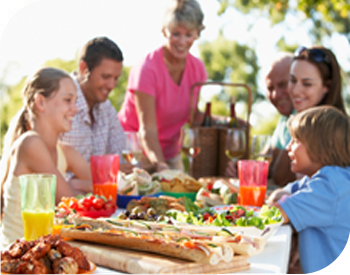 Family reunions can take many forms including picnics, theme dinners and even more formal catered events. Need ideas or help? Call us! We offer amazing food and friendly customer service that will allow you to enjoy your event. Thank you for the excellent job and the outstanding food. I know everyone had a good time, due in no small part to your efforts… this was above and beyond!